Band, DJ, Both, or Neither at the Reception? A DJ costs less than a band and will help move events along, but nothing can replace live music and vocals. On the other hand, the nonexistent price tag on putting together your own CD or MP3 playlist is appealing on an extremely tight budget. Like so many wedding decisions, this is not an “all-or-nothing” proposition. You may find a blended solution that meets both your wants and your pocketbook. Hire a small band for early in the reception, during cocktails, or for only one set; then, have a DJ cover the rest of the event. Overall, if the entertainers charge based on hours booked, this can cost less than having only a band. If the band is beyond your budget, consider a soloist for a portion of the entertainment and a DJ for the rest. You are likely to find freelance harpists, violinists, bongo players, organists, banjo players, sax players, etc., for a fraction of the cost of a full band. Combine your own MP3 playlist with a band or soloist for different parts of the event . Forego either the live entertainment or DJ, and use your own music instead. Rent a karaoke machine. Another approach is to let the guests provide part of the entertainment. Hire someone for a portion of the festivities, and rent a karaoke machine for the remainder. 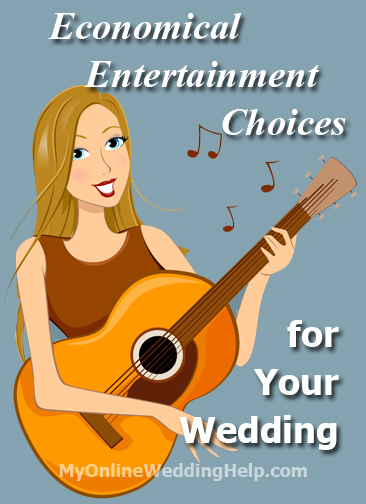 Find free or discount wedding entertainment through friends and family. Knowing someone in the band or a talented vocalist can have its privileges. Ask about having them perform at a discount as a wedding gift to you. Look into having the same people perform at both the ceremony and reception. Depending on your circumstances, your church’s organist may be able to play at the after-party too, or the band or DJ could handle the ceremony as well as reception music. Even if you feel you must have a live band for the full reception, there are still savings to be had. Hire a small band instead of a large one. Fewer members of the band usually result in a lower fee. You will also save a few extra dollars by feeding fewer people. Look for new groups to perform at the reception. Less-established talent charges less than headliners. Find a local up-and-coming band you like. It can be just as a big a hit as a pricier, well-known group. Consider top music students as wedding entertainment. Music academies, colleges, and high schools all have their cream-of-the-crop talent who may be willing to perform for a nominal fee. You can give these untried musicians a chance to gain experience performing before a live audience and ease your budget at the same time. In any case, if you hire someone to provide entertainment, remember most engagements are for a specific block of time. Also, be sure the pros understand the space they will be playing in, so they can correctly gauge what equipment they will need to bring (speakers, etc). You will probably owe more if you require extra speakers or more time.